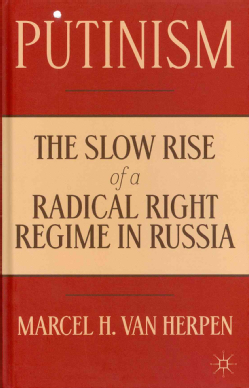 Marcel H. van Herpen, Putinism: The Slow Rise of a Radical Right Regime in Russia (Basingstoke, UK: Palgrave Macmillan, 2013), 278 pp. Russia’s condition in recent years and everything associated with it has been attracting ever-increasing attention on the part of Western observers and politicians. The armed Russo-Ukrainian conflict of 2014, spilling across national boundaries, has added a new dimension not only to international politics but also to Western academic studies of Russia and the post-Soviet space. Every new publication on the subject inevitably comes under the scrutiny of specialists and a broader readership. What is Russia? Who is Putin? What is the regime that he has created? 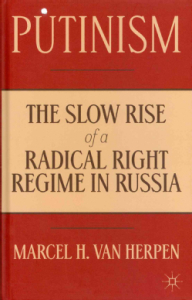 Not long ago Marcel H. van Herpen, the director of the Cicero Foundation think tank, attempted to answer the latter question in his book Putinism: The Slow Rise of a Radical Right Regime in Russia. The book was written and published before Russia’s annexation of the Crimea and the armed Russo-Ukrainian conflict of 2014. That makes it all the more interesting to follow the logic of the work and evaluate its conclusions and predictions in retrospect. Judging by its text, the author was particularly impressed by two previous developments: Russia’s armed aggression against Georgia in 2008 and the so-called Russian Spring—the mass demonstrations of the Russian opposition against Putin in Moscow in 2012. Doubtless it was the author’s hopes for democratic change in Russia that prompted him to dedicate his book to the memory of Anna Politkovskaia (1958–2006) and Natalia Estemirova (1958–2009), intellectuals and human-rights activists whose objective accounts of the “dirty” war in Chechnia and the reactionary policies to which it gave rise cost them their lives. The structure of the book is (perhaps overly) elaborate, consisting of an introduction and twelve chapters grouped in three sections, with auxiliary materials. The author sets himself the task of defining the nature of the Putin regime in Russia by means of a comparative analysis and an examination of the dynamics of its evolution. The first section, which takes up about half the text of the book, presents a comparative account of Weimar Germany and post-communist Russia. The second section involves a search for similarities and differences between fascism and “Putinism.” In the third and shortest section, the author seeks to establish the Putin regime’s similarities with the Bonapartism of Napoleonic France and Berlusconi’s populism in contemporary Italy. The most persuasive part of the book is its account of the internal evolution of the Putin regime in the course of the twelve years following his assumption of power. Growing centralization, repression of civil society, and the crushing of individual freedom together with an aggressive foreign policy intended to revise existing borders in the post-Soviet space—such is the gloomy analysis and prognosis for the next six to twelve years, if not longer, to be found in van Herpen’s book. Unfortunately, that prognosis has found confirmation in the annexation of the Crimea and Putin’s unleashing of armed conflict in eastern Ukraine in 2014, about which much more is likely to be written. I shall address the question of the nature of Western publications about Russia and the post-Soviet space below. At this point, a few words must be said about the dynamics of the development of Western illusions with regard to Russia. Interesting in this regard is the foreword, in which the author briefly describes his career as a professional student of Russia, beginning with his passion for classical Russian literature, followed by “Gorbymania” and hopes for the “normal” development of post-communist Russia. Unfortunately, the author admits, the rule of Vladimir Vladimirovich Putin has put an end to such illusions. True, the Russian Spring of 2011–12 gave him new hope of positive change, but it would appear that this cannot now be taken seriously. The author is left with his cheerless conclusions about the prospects for the further development of the Putin regime. The author’s personal experience may be extrapolated to many present-day Western analysts and politicians. Since the days of Peter I, the Western public has remained under the spell of illusions associated with hopes for the gradual liberalization and democratization of Russia and its rapprochement with the civilized world. The history of those illusions and disappointments, which have alternated periodically in the course of the last three hundred years, is as fascinating as it is monotonous. In all likelihood, the cumulative illusions reveal more about Western society than they do about Russia. The author is amazed by the capacity of contemporary Western politicians to overlook obvious facts reflecting the ominous development of the Putin regime in recent years. Van Herpen comments sarcastically on contemporary Western leaders: President George W. Bush of the United States, who “looked into Putin’s soul” and saw a “regular guy”; Chancellor Gerhard Schroeder of Germany, who peered even more deeply and entered the service of the Russian regime after (or was it before?) the end of his term; Premier Silvio Berlusconi of Italy, who looked in all possible directions because of his personal (so they say) friendship with the Russian president; Premier François Fillon of France, whose field of vision was evidently such as to inspire him to assure the world community publicly that Putin’s Russia was democratic. This list can and should be extended with the inclusion of many Western intellectuals, journalists, and film stars well past their prime who continue to feed off stereotypes about the “inscrutable Russian soul” and demonized super-agents of the KGB. The analysis of the nature and classification of the Putin regime on a comparative basis makes a less definite impression than the analysis of its dynamics. The author identifies three basic components: French Bonapartism, Italian fascism, and contemporary Italian populism. The most intriguing aspect of the author’s diagnosis of the Putin regime would appear to be the comparison with fascism. Signs of fascism in Putin’s Russia have long attracted the attention of analysts. Alexander Motyl in particular was already warning of it seven years ago. At the time, his words appeared to be a polemical exaggeration. Apparently, Western analysts find it even harder than politicians to part with their illusions. It is to the author’s credit that he managed to do so, although, one may suppose, not without inner struggle. Basically, the author concentrates more on a search for differences than for similarities between Putinism and fascism. He notes particularly the role of the KGB in propelling Putin to the heights of power, the absence of an official ideology of racism in post-Soviet Russia, and the active role of the church and the mafia in the life of the state. The author’s conclusion affirms that the Putin regime, given its evolution, contains the set of characteristics required to assign it to the category of fascist regimes, although in a lighter version than the “classical” regime of Mussolini. Readers who accept the traditional view of Russia as a successor state of the USSR, which overcame Nazi Germany in the Second World War, will probably find it hard to reconcile themselves to such a conclusion. It still remains for scholars to explain how post-Soviet society, which inherited aggressive anti-fascist rhetoric from the recent past and made the historical mythology of the Great Patriotic War the basis of its national identity, could precipitously descend into fascism without realizing it. The acknowledgment of that fact will probably become an indicator of the recovery of Russian society in the distant future. For the time being, however, so great a potential of hatred and aggression has been accumulated and deliberately stoked that it will inevitably entail the further erosion of Russia’s social, political, and spiritual culture. Despite a number of convincing comparisons, the author finds Putin’s Russia hard to classify. For him, it remains a puzzle, and he finds “Putinism” a unique phenomenon (“a system of its own kind”) in many ways. True, the author casually refers to the hybrid nature of the Putin regime and its combination of premodern and modern categories. Unfortunately, that thesis remains undeveloped. Yet Russian history can offer contemporary political scientists food for thought no less abundant than, say, the Stalinist USSR, Weimar Germany or, even more, Napoleonic France. The author is insufficiently appreciative of the conclusions reached by the well-known historian of Russia Richard Pipes, although his works focus not so much on the “Russian character” as on the influence in Russian society of the social institutions and values that took shape in the medieval period. The Putin regime reveals itself as no less dependent on Russian history than on the European present. Russian temporality is somewhat different from that of Western Europe. The presence and explosive potential of the archaic is constantly apparent beneath the external appearance of modernization. Only the façade of Russian national statehood has changed in recent centuries, but its basic foundations appear, in Belinsky’s words, to have been “poured and tempered” in some kind of “immovable cast-iron mold” since the times of the Tsardom of Muscovy. Premodern Russian nationalism never disappeared beneath the shell of Stalinist communism. Unfortunately, many contemporary observers do not see this and take it into account. It is not at all surprising that in his search for a conceptual alternative to the compromised ideology of communism, Putin has turned to Russian nationalism. There is hardly a leader of a former communist country who has not taken that path. In the political context, Putin is a direct descendant and restorer of the regimes of Yurii Andropov, the leaders of the coup of 1991, and the war communism that gave rise to them. In the historical context, he stands on the conceptual foundation of Russian religio-imperial nationalism, cultivated by the Orthodox Church throughout the centuries. Even the fascism of which the author speaks is most probably rooted conceptually and politically in the Russian Black Hundreds of the late nineteenth and early twentieth centuries. All in all, there is nothing new and original in Putin’s policy. He is a mere imitator of the reactionary policy of Russian general secretaries and emperors. And, like any imitator, he cannot hold a candle to the original. Stalin combined the communist rhetoric of Leninism with the practice of Russian imperialist nationalism in the course of the war with Nazi Germany. Putin is doing likewise in declaring that former republics of the USSR, from Estonia to Ukraine, are fascist so as to provoke “small victorious wars.” Catherine II annexed the Crimea in a struggle of many years against the still impressive Ottoman Empire. Putin, for his part, made haste to seize the Crimea, taking advantage of Ukraine’s weakness, just as he did earlier with Abkhazia and Georgia. Russian emperors dreamed of Constantinople and strove to reanimate the Byzantine Empire. In the occupied Crimea, Putin is building a resort complex named Tsargrad (Constantinople) and trying to divide spheres of influence with Istanbul in the Black Sea region. Russian reformers attracted national and regional elites of Eurasia by offering them new prospects and opening the door to Europe. Putin, by contrast, is driving former Soviet republics into his Eurasian Union and barricading himself against the West. Perhaps the only novelty here is the blatantly cynical and, I dare say, thuggish lying as an instrument of official state policy. But he has his predecessors there as well. I find it hard to agree with the author that the Putin model is ready for export to other countries. In my view, so-called “Putinism” contains no positive universal models for imitation. It merely reflects the negative, anti-globalist, anti-American, anti-liberal tendencies and values already present in the world, most often of a religio-nationalist bent. Russia is able to support such tendencies thanks only to its resources. Putin’s example may have inspired Yanukovych, as the author says, but all in all Yanukovych and other authoritarian leaders in the post-Soviet space have imitated basic Soviet structures and values, combining them with mafia practices and blatant, cynical doubletalk. For all its deficiencies and limitations, van Herpen’s book rises above many current Western publications about Russia. It must be acknowledged with sympathy that Western expertise on Russia and the post-Soviet space has seen better days. Cutbacks on public and private programs of the Cold War era in Russian and Slavic studies have been accompanied by a decline in the quality of expert assessments and recommendations. I shall cite only a few examples of the professional incompetence of authors who assured their readers not so long ago that the Putin regime has no ideology of its own and focuses on wholly pragmatic goals; that the Russian Orthodox Church plays no role in grand political strategy; that Russia presents no threat to the West or to neighboring states, since it is embedded in international structures, and the like. It is painful to observe that no such “experts” have drawn the appropriate conclusions. As Gogol put it, “they can’t say anything, and you can’t tell them anything.” Obviously, the system of Western expertise in Russian and post-Soviet studies requires change and “radical” modernization no less than the whole system of international political relations based on the notion of the “end of history” and the triumph of democracy. The official mantra of the Putin regime, “Russia is rising from its knees,” is clearly in need of drastic revision. Until then, is it not easier to assume, speaking of Russia in the words of the Russian poet Fedor Tiutchev, that “It may turn out that there is not / And never was any mystery about it”? Putinism, pp. 2, 3, 8. Martin E. Malia, Russia under Western Eyes: From the Bronze Horseman to the Lenin Mausoleum (Cambridge, Mass. : Belknap Press of Harvard University Press, 1999). “What is striking in these rosy expectations is that they completely contradict the trend of the last 12 years” (Putinism, p. 2). “…an unstable system of hybrid ‘fascism lite,’ which combines elements of proto-fascism, fascism, and post-fascism” (Putinism, p. 8). “…still enigmatic system” (Putinism, p. 203). Putinism is “a new right-wing radical political model, ready to be exported abroad” (Putinism, p. 9). See Andrei Makarychev, “Ontologicheskaia depressiia i otsutstvuiushchii tsentr ideologii: Rossiia glazami zarubezhnykh ėkspertov,” Neprikosnovennyi zapas, 2013, no. 6 (92). The author refers particularly to the following publications: L. March, “Nationalism for Export? The Domestic and Foreign-Policy Implications of the New ‘Russian Idea,’” Europe-Asia Studies 64, no. 3 (2012): 402, 409–10; M. C. Spechler and D. R. Spechler, “Russia’s Lost Position in Central Eurasia,” Journal of Eurasian Studies, 2013, no. 4: 4. Something similar is also going on in Ukrainian studies, which are now infested by a considerable number of self-styled “experts.” See Alexander J. Motyl, “‘Experts’ on Ukraine,” World Affairs Journal, 20 March 2014 (http://www.worldaffairs journal.org).